A multi-purpose vape device designed for high-performance experience, the Vaporesso Switcher 220W TC Starter Kit integrates the new OMNI Board 2.6 for a technological update to pair with the NRG Sub-Ohm Tank. 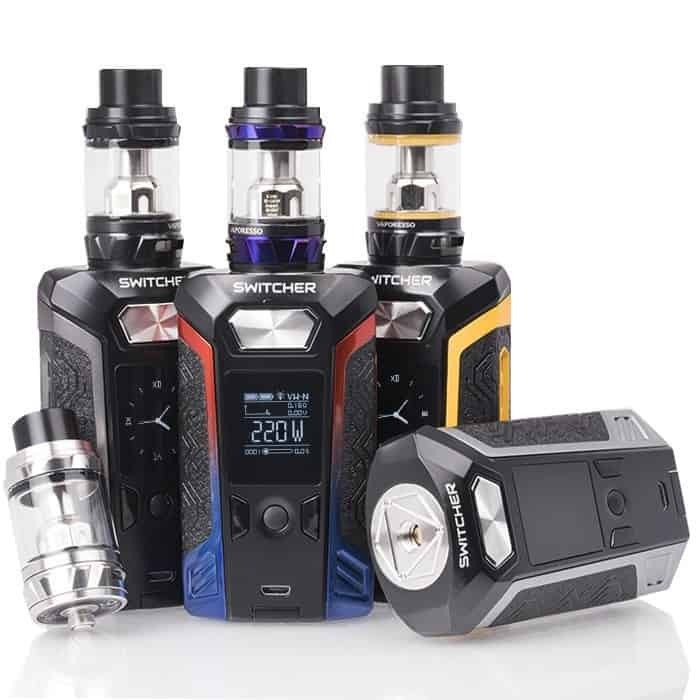 Designed to be the new powerful flagship system after the Revenger X, the Switcher 220W Box Mod is designed with futuristic details and ergonomic elements in-mind. Constructed from high-quality zinc alloy materials, the main frame provides a pinpoint lines while the implementation of interchangeable/replaceable case allows for personal customization. The internal chipset features the newest OMNI Board 2.6, with the addition of graphical visual keys, “unlock” functionality, puff number statistics, and more. Included with each kit is the Vaporesso NRG Sub-Ohm Tank, the flagship Sub-Ohm platform featuring 5mL juice capacity, Slide-n-Fill top-fill design, mesh drip tip, dual bottom airflow control, and the versatile GT Cores. The GT Cores offers a wide range of coil options with traditional cotton and signature cCell Ceramic in each structure. Included in the set is a 0.15ohm GT 8 Core with a maximum wattage of 110W and a 0.15ohm GT 4 Core with a range of 30 to 60W. Note: A special LE Version is available with the Vaporesso Switcher Kit, featuring Lightning Effects during operational use, similar to LED Light-Up functionality. Also, the Switcher was formerly known as the Transformer.